It looks like the wormtounges are being found out, while those who are of faith are standing taller. The buildings older generations worshiped in may be sold, or destroyed, but the challenge remains. Leave our sin to one side. Shuck off the burdens of our society and their expectations, and run the course set before us. For our goal is not to be as the world. It is to be as Christ. 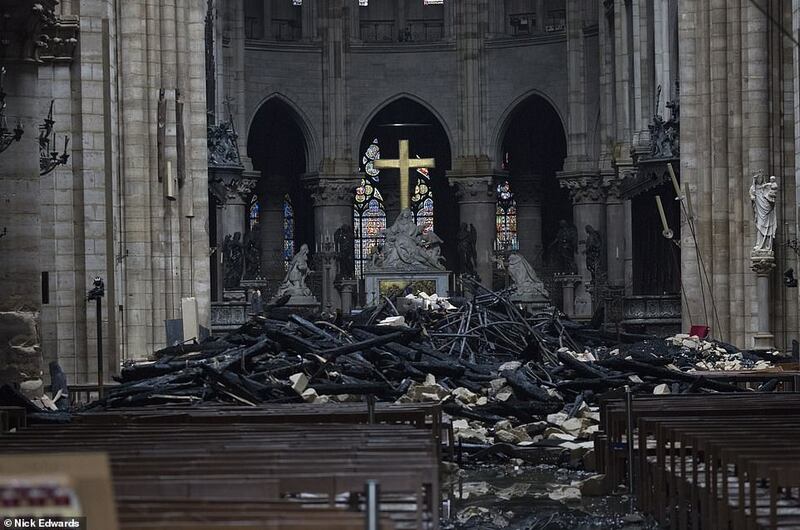 Post fire, Notre Dame, via Vox Popoli. 12 Therefore, since we have so great a cloud of witnesses surrounding us, let us also lay aside every encumbrance and the sin which so easily entangles us, and let us run with endurance the race that is set before us, 2 [a]fixing our eyes on Jesus, the [b]author and perfecter of faith, who for the joy set before Him endured the cross, despising the shame, and has sat down at the right hand of the throne of God. Lectionary on the burning of Notre Dame. Today one of the French national treasures and the Cathedral of Paris, Notre Dame, has burned out of control. There are promises to rebuild. The great and the good are horrified. The good news is that the church is not the buildings, but the people. Buildings burn, particularly if neglected, and institutions fall because of rot, often deliberately engendered by the enemies of the gospel. But the church survives because the gospel survives. Christ is not with us, but his work remains. And that matters more than any cathedral. st be lifted up’? Who is this ‘Son of Man’?” 35 Then Jesus told them, “You are going to have the light just a little while longer. Walk while you have the light, before darkness overtakes you. Whoever walks in the dark does not know where they are going. 36 Believe in the light while you have the light, so that you may become children of light.” When he had finished speaking, Jesus left and hid himself from them. It is not the church we need to fear, but that we will be in the darkness, without the light of the gospel to guide us. Let us always look there. Notre Dame has burned, and this is a loss of a place of art and worship. But the work of Christ continues.